In this fast paced world, the tolls of our fast paced lives and unhealthy lifestyles stake their claim on the health of our skin. Not to mention the dust, grime, dirt and pollution of our environment. It is imperative that we pamper our skin especially our face. Because it is what other people see when we talk to them. The face needs to be tended to and taken care of. After all, it is one of our most noticeable assets and even an instrument of vanity. Pampering is all about loving. 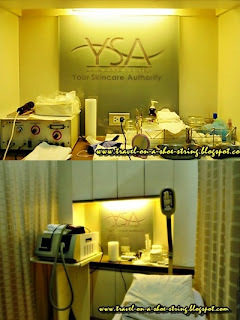 So, one afternoon I went to YSA Skin Care Center to have some facial and diamond peel. 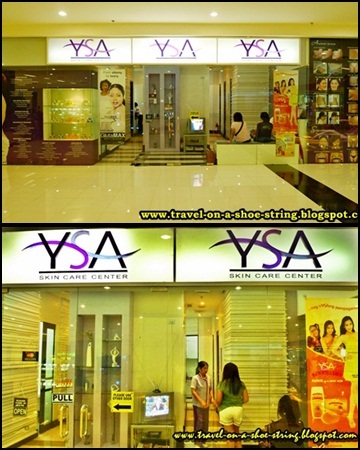 Upon entering YSA Skin Care Center, I was welcomed by the receptionist and the resident dermatologist. They asked me to fill up some form then asked me what services I will avail. 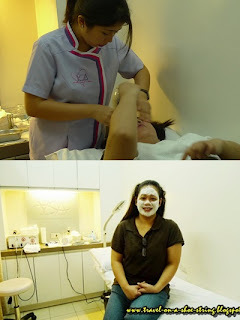 I chose facial with diamond peel as my treatment of choice. I then sat down and waited for my turn. While waiting, I saw these posters which detailed their available services. Bali's transformation is one for the books! Yes, customers can while their time away watching TV. The staff asked me to wash my face in the sink using the Papaya Liquid Soap. They then let me sit down and applied mask on my face in this area. After putting on the mask, the staff turned on the fan to dry the mask on my face. I was then instructed to lie down on this bed. I then waited for the nurse to do my facial. This nurse is well trained in performing facial. She's also the one who performed the diamond peel on my face. Whoaaaaaaaaaaaaaaaaaa! It is me. Do not be afraid :-) ha ha ha! 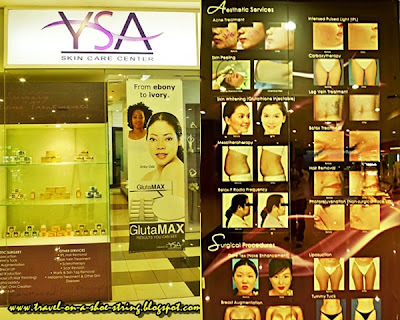 For the benefit of those who are not familiar with Diamond Peel plus Facial at YSA Skincare Center here are some FAQs I asked the good doctor so that we could all be enlightened! Diamond Peel is a fast and pain-free non-surgical exfoliation of the skin using natural diamond chips while at the same time vacuuming the dead skin cells away. It rejuvenates the skin leaving it remarkably supple, vibrant and youthful-looking. It removes the topmost layer of the skin without the adverse effects of loose particles, irritation and skin reaction. It restores and maintains the health of the skin with little or no redness at all. Through the regeneration of the epidermal cell structure, the skin's elasticity and collagen level are improved. And because the outer layer of dead skin cell is removed, it promotes the growth of healthy new skin cells and leaves a smoother skin texture. What results can be expected with Diamond Peel? An improvement in the skin's texture and appearance will immediately be noticed. Age spots, fine lines and freckles will be erased or diminished. Stretch marks and acne scars will be less evident. Lots of patients tell that their skin appears more even, smoother, suppler and younger. Diamond Peel uses a gentler microdermabrasion approach which features a dual control system and adjustable applicator head that delivers a steady, effective stream of fine diamond directly onto the skin. The old surface is removed leaving it smooth, fresh and rejuvenated. It erases the epidermal layers at varying depths in a safe, controlled manner. This approach respects the integrity of the skin and promotes even healing. How soon can I see visible results? Your skin may look slightly rosy immediately after the treatment. Right on the first treatment, your skin will look fresh, smoother and radiant. Your skin will further improve as you continue with additional treatments. Regular maintenance visits will enhance the long term results. How often should treatments be given? Frequency and spacing of the treatment depends on the area and type of skin being treated. Like all other microdermabrasion technique, diamond peel is a progressive skin rejuvenation procedure. To achieve maximum result, recommended number of treatments ranges from 2 to 12 sessions spaced one week apart to one month apart. Since the process is so gentle, you can have as many treatments as you need without any side effects. What are the advantages of Diamond Peel over other techniques? Diamond Peel is a safe, precise and effective. There is less or no discomfort at all. 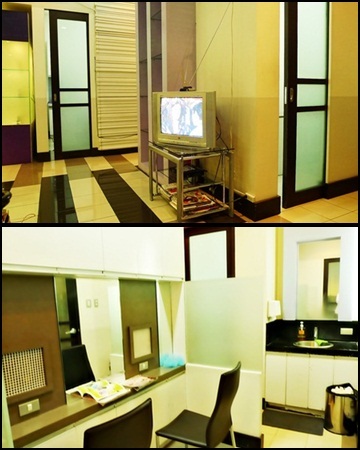 Each session of Diamond Peel takes about 10-20 minutes. However, stretch mark treatments can take as long as 2 hours. 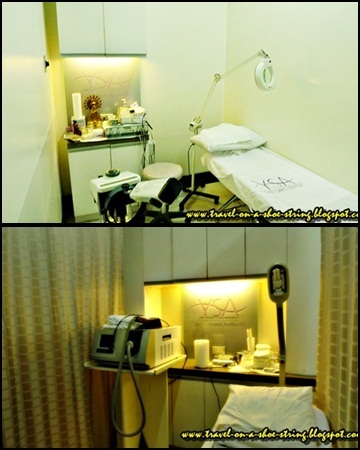 The treatments are individualized to the needs of your skin condition. The next time you find yourself so stressed out, pamper your skin, have some Diamond Peel plus Facial at YSA Skincare Center. With them, you're surely in good hands. Hi! I want to have my first facial ever. How much do they charge for the Diamond Peel?